This citrusy serum is fast-absorbing and lightweight. A prominent ingredient is lemon essential oil, which is renowned for helping to reverse hyper-pigmentation, evening skin tone and renewing dull-looking skin. It’s also antiviral and antiseptic, helping to reduce the frequency of breakouts. The serum is fortified with lemongrass essential oil, which acts as an astringent. This product should only be used in small quantities at night and rinsed off in the morning. Lemon Serum is suitable for acneic skin that has dark spots and an uneven tone. Caution: Lemon essential oil can cause heightened photo-sensitivity, increasing the skin's vulnerability to sun damage. 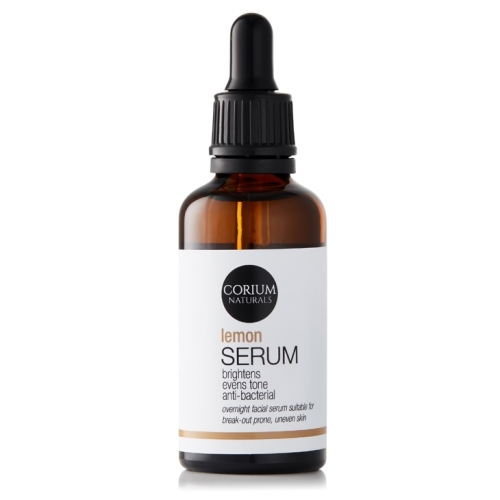 Lemon oil in this serum is used in low dilutions (<2%) to minimise this effect. Corium strongly advises all clients to use this serum at least 6 hours before being exposed to direct sunlight (and UV rays). Notify me when 50ml Lemon Brightening Overnight Serum 50ml Lemon Facial Serum is available.